For their exhibition at Peckham Space, Sarah Cole and the TRIBE of eleven young girls (from Southwark Youth Service) played and explored around the themes of female adolescence, feminism, group dynamics, hiding and inclusion. For the short period of seven weeks, they ostensibly formed a tribe of their own and explored its motifs, its ceremonies and its significant activities. They have now turned Peckham Space into a journey of their clan – a living game of Hide-and-Seek leaving clues and ideas about themselves, about womanhood and about their place in both secret and public worlds. The installation doesn’t focus on a single visual point of expression, but has become an enjoyable space of touch, smell, taste, feel, vision and intuition, where the viewer can be simultaneously included and rejected from the ways of the TRIBE – as it is when you’re a teenage girl. The green exterior of Peckham Space and its overtly-geometric outside fuzzily merges with its inside through the presence of turf. Real turf. Their turf. Soft underfoot and smelling faintly of petrichor. It immediately conjures all the Rococco images of grassy picnics, swings and lassez-faire frollicking that Fragonard would have loved. Except it’s South London and the frollicking in this show is being done by a small pride of fierce girls in bright, colourful full-bodied onesies and animal masks. Most of the ‘play’, crucial to their work, is revealed on video – a nice triple entendre. Most of the videos reveal the dance/movement performances the TRIBE did during their time with Cole: rolling and dancing on hills, cavorting on workshop floors, in public – displaying none of the usual self-consciousness of girls in early adolescence. The video which sparked my interest the most showed one of girls drumming on cardboard box in Peckham Square at night – it was menacing, a challenge to all the forces, to fight, a reference to home (lessness) and being a woman at night in an open city square, masked in a onesie, Powerful and vulnerable. The imagery was reminiscent of Gob Squad’s Super Night Shot (the onesie and the mask, slowmotion, at night) and it held the same playful and challenging spirit to public space and storytelling. But with the added friction of the main protagonist being a young teenage girl calling on a power uncommonly portrayed. The onesie is an important feature of this show. I must confess to being a little cynical and my first impression of the onesies hanging in the gallery was a groan – against an item that seems to have gained cupcake status in certain female sections of the creative community. However, in this context, it was the perfect costume to reveal the actions of adolescence, whilst avoiding the unwanted (male) gaze and unnecessary distraction of fashion with all its heavy and sexualised symbolism. It seemed to allow the girls to play without burden, to really move in new ways and to connect with the self. Perhaps similar to the role of the burqua in certain religious circles (or so I’ve heard) – a removal of the pressure to match outsides with insides. Peppered throughout the space are points of musical connection. In the entrance, a gorgeous old record-player plays a custom vinyl of music from the group (arranged by Isa Suarez), a cuckoo clock keeps a rhythm for the show and on the opening night, a drum kit was set up outside the gallery – free for anyone to bash on it – a chaotic counterpoint to the ice cream truck playing Greensleaves. When I spoke to Cole about the reasons sound and music were connections between ideas, she suggested that it was instinctive. It makes sense to me that this, in particular, was the means by which the presence of intuition in the TRIBE was was conveyed: the relationship to sound is personal, without necessarily being gendered, class-based or ascribed the heavy weight of society that visual or even performative works can be. It is a lighter touch to speak of identity and perfect for the in-between-ness of a group of teenage girls. Thanks to this show, Peckham Space has acquired a new mantel over the entrance with a fluorescent re-naming as Buckingham Palace. Lit up until 3am, Cole thinks that the outside of the gallery now ‘looks more like a nightclub than a gallery’. The duality of irony and appropriateness betwen the hot mess of bustling Peckham is so cheeky, it’s delicious. And that same Buckingham Palace motif again switches from outside to inside, becoming a score for the small music boxes that are mounted on the walls. You can literally ‘play’ the word Buckingham Palace over and over again. Cole was forthcoming with a lot of information about the show – the meanings and processes behind the works, but when it came to discussion about Buckingham Palace, she chose to not reveal its significance. It was part of the language that stayed solely with the TRIBE – hidden and private. Special. The opening night was, in tribal terms, a ceremony: it gathered together all the people involved in the TRIBE (and those of other tribes), to come together over food – free softserve icecream, drink, drums, music and costumes to exchange ideas, ways of doing things; to touch palms. One reason I make this self-consciously gauche analogy of the occasion in tribal terms is because of the relationship between adolesence and rites-of-passage (and not just a thoroughfare in front of Peckham Library). In white, western, especially urban environments, we have ceased to continue those actions that acknowledge movement from one state of being to another. The other reason I bring up the quasi-ceremonial aspect to the evening is because it presents an entirely different percption of the exhibition and of the TRIBE than the one most people will experience. Those present for the event received the full extent of their expression. 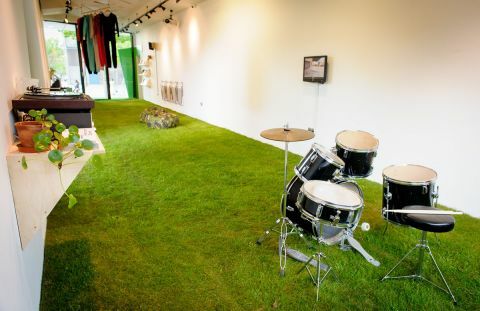 Most people will see the exhibition in its quiet, daily manifestation: a slightly kooky place with slowly-degrading and trodden grass, video works of girls twisting and birds killing, not a lot of noise, save the record overhead and the sound of traffic outside. It will become a much more contemplative ‘village’ and some of the underlying ideas will not be translated, whilst others, perhaps sadness, death, loneliness, will really come to the fore. Yet, this is me, a white woman from an urban setting, nativising the whole situation, which I acknowledge is problematic. Cole herself mentioned its problems, but is still seeking to discuss these ideas of Tribes (as opposed to Communities) for group dynamics. Can a bunch of girls from disparate racial, social and class backgrounds create a new tribe for the purpose of talking to each other and creating new cultures? Why did it work so well? These are the kinds of questions that I suspect drew me to the exhibition. As well as revealing aspects of identity and definitions of femininity, like any good exhibition, it continued asking me more questions than those it answered. Important ethical questions, like what is the role of the elder/artist for a group of young teenagers in contemporary life? Is it to guide? Is it to draw from and adapt either the past or other worlds in order to understand this one? Or is it to only present our own experience – with all its inherent benefits and problems, and allow them to take what they will? Adolescence is difficult for everyone. This exhibition, rather than ‘fix it’, has found a way to continue to explore it without it being painful or saccharine. It opens up the gallery and the discussion – from inside to outside, to allow for those questions and that difficult fuzzy space to hang; unanswered, but honouring the process of being allowed to work it out. Just like being a teenage girl.